This modern and rich equipped villa with pool is located in Vabriga, approx. 10 km from Porec and 1 km from the sea. Located on its own fenced yard of 700 sqm, the villa offers its guests a well maintained lawn, 35 sqm large private swimming pool, covered terrace with sitting set, outdoor kitchen, one parking space and a garage for one car. Built in 2012, the Villa Allegra offers a high level of comfort with higher quality furniture and interiors furnished with high quality materials, from stone-covered floor and stairs, through bathrooms equipped with first-class designer facilities to the exterior woodwork of mahogany, all in this luxurious home is subordinated to the enjoyment of its guests. Besides this, the villa also has a sophisticated heating and cooling system which allows precise adjustment of the temperature in each of the rooms, as well as the intensity of the underfloor heating during colder periods of the year. The house is connected with another identical house, but thanks to the green fenced garden, the guests of the villa Allegra have complete privacy ensured. 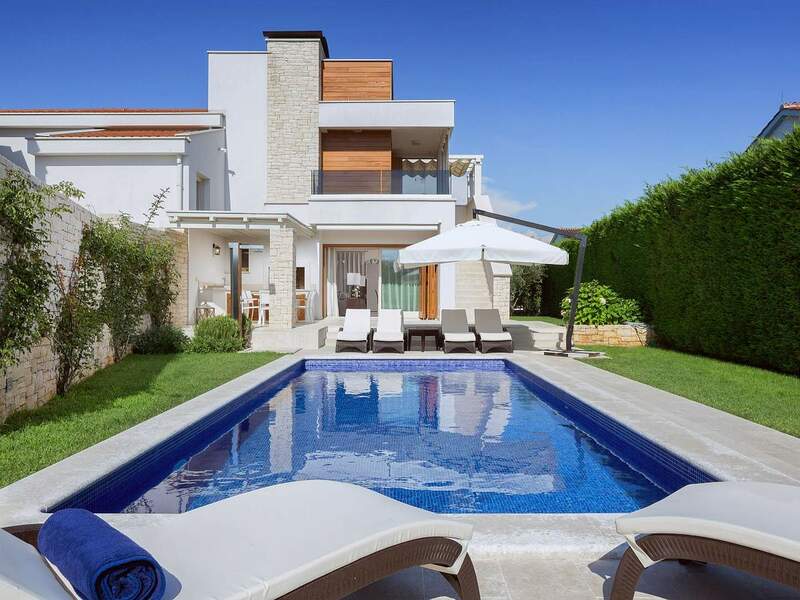 Villa with swimming pool for 6 persons of approximately 169 sqm on two floors. On the ground floor there is a spacious living area with a fully equipped kitchen, dining table and living room with fireplace with exit to the garden with swimming pool, terrace and outdoor kitchen, one bedroom with double bed, shower/toilet. On the first floor there are two bedrooms with double beds and a terrace, one with shower/toilet and one with bath/toilet with whirlpool bath and separate shower.